This walking tour of inner city sites in Melbourne is designed to offer an insight into local Indigenous history and culture with a view to increasing our awareness and sensitivity to the social, political, physical and spiritual forces affecting many Indigenous Australians both in the past and today. Its designed to be part history tour, part prayer walk and part cross culture learning experience. This is a great exposure event for local Melbournians as well as interstate groups who we can also tailor related exposure and visitation events (as well as fun tourist activities) for with local Indigenous Christians. 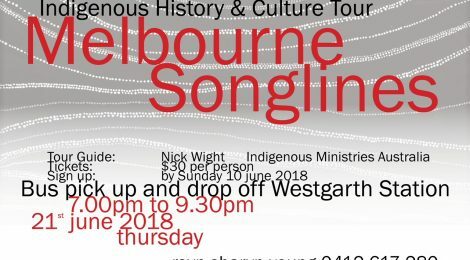 Melbourne Songline tours are for any church groups, leadership teams, study groups or anyone looking to learn more about the Indigenous and Christian history of the Melbourne area. Group sizes are limited to 10 people. Pick up and drop off Westgarth Station – the tour takes place in the suburb of Fitzroy. $30 per person Please sign up on the registration sheet by June 10 as we need to confirm numbers. Chat to Sharyn for more informatino about this tour.